DreamCrete Custom Creations has built a reputation in Central Florida for delivering quality Decorative Custom Concrete. We offer Concrete Countertops, Polished Stained and Stamped Floors, Concrete Sinks, WaterFalls & Fire Features, Pool Patios and Driveways and other designs that are truly each one of a kind. Our team will make sure that your dream becomes a reality. If you are thinking about refinishing your floors or remodeling your home, give us a call. One of our concrete artists will come to your home or business to give you an in-person quote on the project. The founders of Dreamcrete ( Zach Dandera , Gary Millar & Bruce Powers ) combined 18 years of experience in contracting, customer service and management fundamentals to form a solid foundation for our business. Dreamcrete literally started with a dream in a 200 Sq Ft garage, and from there they quickly grew to a 1200 Sq Ft.  In 2017 Dreamcrete moved their facility to a 3000+ Sq Ft Warehouse that allows for multiple projects and better tools and equipment. Our core principles were founded on the belief that building long-lasting mutually beneficial relationships in both business and customer base are essential to success. Dreamcrete practice of constant research and development of current applications allows us to offer new and exciting products. Dreamcrete Custom Creations has completed training with The Concrete Countertop Institute and worked alongside wonderful artisans in the industry from different countries. Dreamcrete has trained and been certified in the processes of innovative materials supplied by Elastocrete. DreamCrete completed training by decorative concrete pioneer Bryan Gauthier of Something Better Corporation in Arizona on Award Winning Sinks and Large Water Walls. DreamCrete has also been trained by Select Surface Solutions of Central Florida that offers a variety of concrete building and remodeling materials for both commercial and residential projects. Starting in 2017 DreamCrete will be using Select Surface Solutions products alongside their wide selection of others to always offer the best quality to the client. DreamCrete has also been trained by Dan Lynch of Dan Lynch Flooring in the unique Concrete Texture Flooring. We continue to explore modern design ideas in addition to utilizing cutting edge raw materials so that we consistently exceed expectations.